Our positioning within the cultural map of time is the result of humanity’s constant search for identity and meaning. My working practice is concerned with this poetics of being in relation to place (the present/environment) and intellectually how we have arrived here (through our past/histories), and the potentially to navigate our future/s. My specific interest in art has evolved into the metaphysical aspects of being and the dualism that arises, between our transient ephemeral conscious realms with their different natures, in relation to being constant incorporeal unconsciousness embodiments. The relationship between being and the world we experience around us, informs the world/s we live in, from the private to the community. Art through its creative process is an integrated and alchemical transformation of the self and consciousness. It has a vital role for the well being of the individual in todays’ society. As Gandhi said, “Be the change you want to see in the world”. Brian Patterson (born 1958) is currently working as administrator and co-ordinator of projects for Bbeyond. 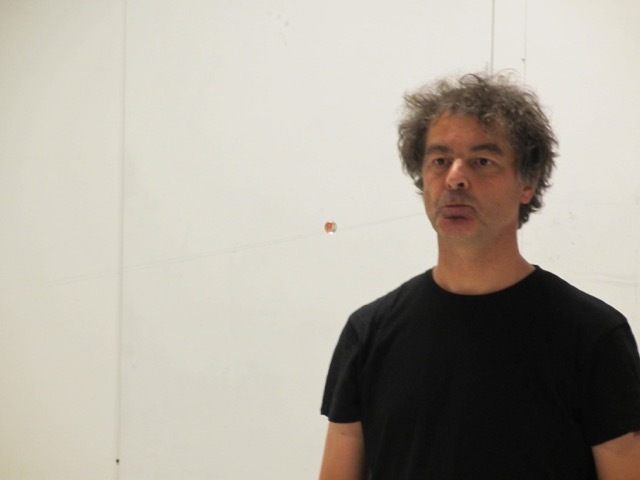 He was involved in the setting up of Bbeyond in 2001 to promote performance art in Northern Ireland.